As the clock approached eight and the polls closed, decision time lay ahead. The sidewalk made for some clammy hooves and the trot back was achy making street duty less than pleasant. Among the candidates, Joe Mindak and Eduardo Gonzalez extended pleasantries. The brief passing with Timmy Occhipinti at 14th and Washington St. unsurprisingly less so. 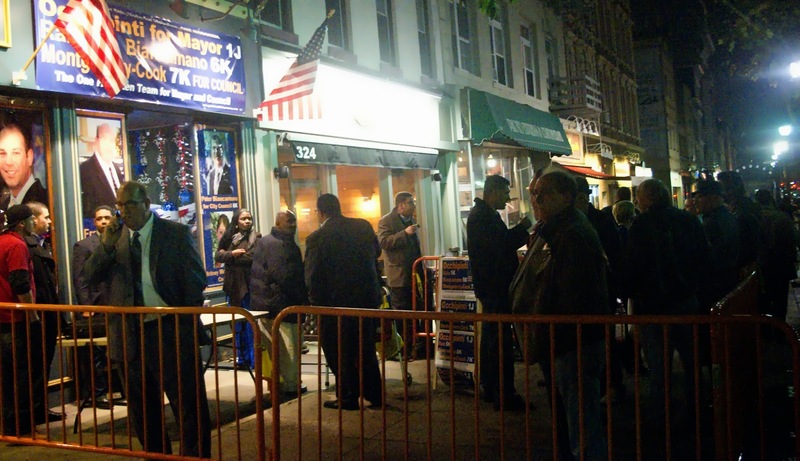 A woman with Occhipinti's small crew bellowed out to passersby to "vote for my brother." She seemed too nice to be related. The Ruben Ramos campaign conveyed late optimism Election eve and one member of the campaign said they thought Ramos had a shot of winning along with one council candidate. (The council candidate wasn't named.) An unofficial operative for the Ramos campaign began texting around 7:30 pm mocking the voter turnout and saying Zimmer and her team were doomed. Horsey quickly responded letting him know turnout was similar, as that proved accurate when the private call of between 12,500 and 13,000 votes came in at 12,900, an increase over November 2009. The Ramos operative was given time for prayers and Da Horsey texted back "Prepare for the SWEEP!" At least he bought kleenex in advance. After the polls closed, a quick retreat to the stable where an inner debate continued. Stay for results to post for the public or hoof it down to Zimmer HQ and hope nothing of importance occurs in the interim? As reported on MSV exclusively, it wasn't long before the blockbuster of the night would roll in foretelling the Reform sweep across the board. Marine View had suffered an earthquake, 9.0 plus on the Richter scale and First Ward Councilwoman Terry Castellano must have had a heart attack when she learned Team Zimmer had swept "her" towers and with it Kids First too! Pen of losers: The HPD cordoned off most of the sidewalk outside Raia-Mason HQ on Washington Street as Frank "Pupie" Raia (l) speaks on the phone. Councilwoman Beth Mason seeing Da Horsey slipped away into the office on this second photo of the scene but one of her long time consultants is seen middle rear, a solitary figure absorbing another Mason election disaster. With expenditures perhaps more than the other two mayoral campaigns combined, it managed a measly 17% of the vote. Beth Mason is now allying with a south NJ State Senator close to Gov. Chris Christie seeking... something to alter her string of Hoboken election failures. The rest of this story is MSV Premium. If you don't receive it please email smartyjones@me.com.